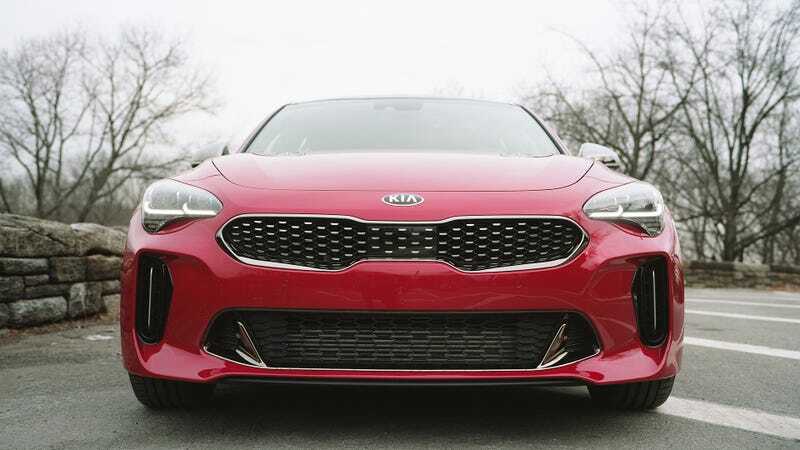 The Kia Stinger is one of the more interesting cars to come out in recent years, and it needed some good photos to go along with it. Luckily Jalopnik has Kristen Lee, who shot the actual review, leaving me free to snap some extras on medium format film just for the hell of it. Film isn’t really something that you want to be shooting for work. The turnaround is slow. You don’t know if you’ve inadvertently fucked something up that can’t be fixed in any edit, something that (in this case certainly) can’t be re-shot. The car went home to Kia immediately after Kristen and I were done with it. But since Kristen had digital covered, I was free to take out my Fuji GW690iii and take some pointlessly high-resolution shots of this car for fun. I’ve been on a big kick for Fuji slide film for some time now, very much enjoying running through rolls of 35mm Velvia and Provia for its kind of realer-than-real sheen. But slide film takes days to get back from even the quick developing shops here in New York, and by then these shots would have really been past their due date. So I grabbed some Kodak Portra 160 I had lying around, figuring that if I was going to experiment I might as well really futz around with a lot of different variables: Kodak not Fuji, negatives not positives, medium format rather than 35mm. If you are wondering how these film photos ended up here, on the internet, the process is fairly simple. A couple years back a colleague pointed out that I would have a lot more leeway in digitally editing my film photos if I bought a flatbed scanner, something that seemed expensive at first. (I picked up an Epson V550, if you’re curious.) But now I save a decent bit of money and a whole lot of time by just dropping off my film for developing only and getting back (in this case) just the negatives alone. From there I don a pair of white cotton gloves, get out a can of compressed air and scan my film on a flatbed scanner hooked up to my laptop. It’s easy for these big negatives to get dusty, hence the gloves and compressed air. I assume I look somewhat silly, bopping around with my headphones on, in white gloves, surrounded by cables and a whirring scanner, tooting compressed air at everything. The whole process took, oy, a lot of time. The GW690 produces a 6x9 negative, as big as medium format gets, and it takes the scanner about ten minutes to process each individual frame. The big Fuji camera only shoots eight frames per roll of film and I went through two rolls, ultimately taking me about three or four hours to scan and edit altogether. At the very least, the whole system encourages you to edit less. Once it’s half past midnight, you don’t really want to over-edit anything. Again, from a digital starting point, shooting like this is really quite pointless. Not only can you not see if you fucked up a shot, you can’t even tell if you fucked up your exposure at all. The GW690 was meant to be about as simple and workmanlike as a camera could be, and it doesn’t have a built-in light meter. I have to use an app off my phone to double check that I’m not making a picture too light or too dark, and was left largely trusting that I didn’t screw anything up or else I’d burned through a full shoot and about $20 worth of film and developing. But at a certain point you do have to trust yourself, and then you relax a lot more. You spend a lot less time staring at your camera’s screen and more time looking at the car, the surroundings, the light shifting halfway in and out of the clouds. Well, mostly I stared at those outstanding turn signals. Look at those. What a joy. The car itself, I should say, is a total joy. The interior is not my favorite, as the graphics for the nav on the touch screen look tacky, there’s a weird fold in the dashboard above the air vents and the brushed aluminum on the center console seemed unusually prone to picking up chips and dings. The throttle pedal was also a little annoying, kind of jumpy right at the start. I think people call this the “tip in?” I don’t know. It’s not great for slowly backing up next to a rock wall up at the Cloisters, only trusting the backup camera as the rear window is hopelessly small. But there’s something about the car that’s deeply satisfying, hearing the warble of the twin-turbo V6 and knowing that the car could roast its rear tires if you so desired. It’s faster than you expect, but not manic, engaging and approachable. At least, it was nice getting up and down the west side of Manhattan, surging up to speed and making kids and construction workers do double-takes when you’re at a light. I could make some sort of connection between the Stinger and film about imperfections making you notice something’s strong points all the more, but that’s a bit of a stretch. Both are a little needless, and fun and a good way to waste some time up at the Cloisters.